Brain-Eating Aliens Take Over Congress, Just In Time For The 2016 Election! the daughter of a Democratic political dynasty who left Washington, D.C. to become a documentary filmmaker, but is pulled back into the family business when her brother, the senate majority whip, needs her help running his senate office. Now a young, fresh-faced Hill staffer, Laurel discovers two things: The government has stopped working, and alien spawn have come to Earth and eaten the brains of a growing number of congressmen and Hill staffers. Contact the author at charliejane@io9.com and follow her on Twitter @charliejane. 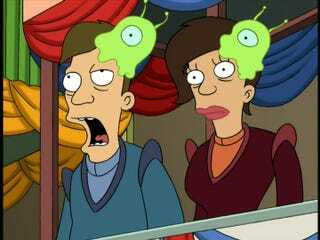 Top image: Futurama.